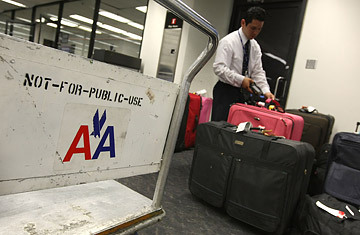 An American Airlines employee scans baggage. "Welcome aboard JetBlue Flight 888. There are four lavatories aboard our Airbus A320, and a $1 service fee to use them. Correct change is always appreciated." No, it hasn't come to that yet. But JetBlue, an airline initially known for its innovative service and comfy planes, has taken the current mania for bolt-on fees to a new altitude by imposing a $7 charge for a pillow-and-blanket set. JetBlue played up the hygiene side of it: the sleep set, which you get to keep, "blocks all micro-toxins larger than one micron in size, such as dust mites, mold spores, pollen and pet dander," according to the company. The suggestion is that every airline pillow that ever touched your face before was first used as bedding by the pilot's pet pooch before being handed to you. In the face of runaway fuel costs, the airlines are desperate to increase revenue without raising fares. They don't want to shrink demand with higher list prices, nor do they want to be the high fare when consumers scan travel websites for deals, nor break through certain price levels. So they have added a menu of charges, which vary by airline. The only constant is passenger frustration. First it was meals, then baggage, then soft drinks and bottled water, and finally, JetBlue's blanket policy. That's different from most consumer companies, which try simplify the purchasing process and make the value proposition easier to understand. The airlines have chosen to complicate the purchase of their product  the notion being that you pay for only what you use  and in the process, they hope to boost revenues. So far it's not working. JetBlue, for example, lost money in its most recent quarter. And nearly all the carriers have had to shrink capacity and raise prices anyway. The airlines' unwillingness to offset the entire cost of rising fuel prices directly is part of air travel's 40-year, post-deregulation descent into denial. Long after the friendly skies became a lot less special, long after multiple bankruptcies and the demise of TWA and Pan Am, the airlines continued to delude themselves, and us, with the idea that flying is glamorous. We all know better. On a recent United flight I took from Denver to New York City, a veteran cabin crew were turned into seething sky sherpas because United had lopped off one attendant from their complement, and the plane was chock full. Stuff was stuffed everywhere because no one wanted to fork over United's $15 fee for a bag. "See you in about 35 minutes," said one flight attendant as she rolled the beverage cart toward the front. Upon her return, a guy in front of me complained about the slow service, and she snarled right back at him. Like the rest of us, she wasn't in the mood to be reminded about awful the experience had become. You want a snack with that insult, sir? That will be $6.